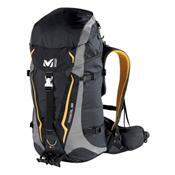 Take the Millet Radikal 32 Backpack for technical mountaineering treks all year long. This high-tech mountaineering pack gives you the features you need to lug your gear without adding pounds to weigh you down. Made to accommodate expert climbers, the Radikal flexes with your movements and withstands tough conditions.